Rivetz (RvT) The decentralized & mobile cyber security token. Rivetz is a “first-mover” with patent pending cybersecurity services and capabilities that leverage the Trusted Execution Environment (TEE). By providing a vault to isolate and protect keys and encrypted material from apps, malware, users, and hackers, Rivetz is focused on providing a truly safe experience for accessing all digital services – maximizing the quality and value of the provider-to-subscriber relationship. Rivetz has been building this technical foundations for 3 years and has existing contracts with the U.S. government. The technical models for attestation have been part of global standards from the European Union to OASIS to NIST for many years but the economic model has been missing to support this ecosystem. Rivetz’ leadership has been part of the governance in this industry for the last 20 years, driving the adoption of trusted computing hardware and developing the technology services and economic models to put trusted computing to work. Rivetz’s existing platform provides a unique set of market-leading solutions that have already generated over a million dollars in recent contract awards. 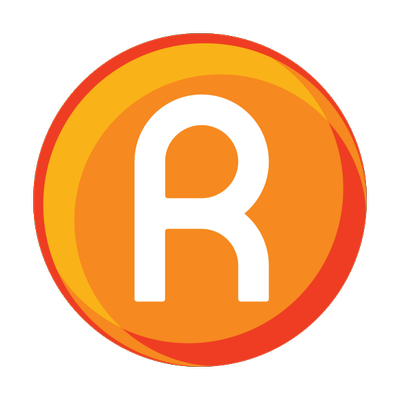 Rivetz’ services and solutions can be leveraged by application development partners and service provides to enhance the value of subscribers on their systems. The company has a strategic relationship with Trustonic, giving it access to over a billion devices already in the field. Rivetz has also initiated discussions with major, established technology companies to support their commercial TEE solutions and potentially add billions more of devices that can utilize the Company’s capabilities. Rivetz has invested over 3 years in executing a well-thought-out and novel strategy to create the market and capitalize on this substantial opportunity. In Q1 2017 the company was awarded a US Government contract and in Q2 it was further awarded an SBIR contract by the Department of Homeland Security (DHS) Science and technology (S&T) directorate. By simplifying the user experience and assuring that information is delivered as intended, Rivetz’s solution could unlock new models and services and provide value to users for years to come. Rivetz believes it has the short-term tactical plan to quickly engage customers to drive revenue, and the long-term vision to unlock the full potential of the technology which will produce a game changing market opportunity. 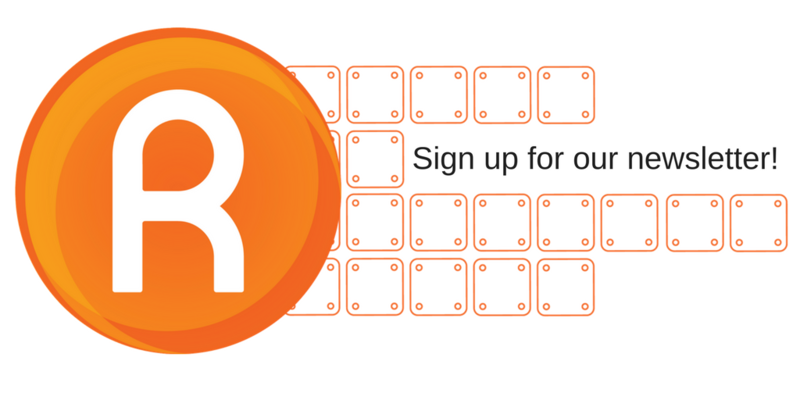 Rivetz existing solutions and application enable protection of keys and protection for messages, and already provide a solid starter platform to deliver the real cyber security control attestation of the health and identity of the device that creates a secure message or instruction. The Rivetz solution contemplated with the RvT is further intended to provide cyber security based on math that can prove that measurements made have not changed over time. There are no silver bullets in cyber security, and everything is vulnerable, but these tools represent simple integrated cyber controls that Rivetz believes are world-class and military grade. In 2016, Rivetz built a reference architecture to validate the health and integrity of the device as an integral part of the transaction on a blockchain, delivering a decentralized cybersecurity control providing proof that the device’ internal and external controls were in a reference condition prior to the completion of a specific transaction. The following discussion explains how Rivetz intends to use a new token to enable the administration and operational security required to accelerate the use of these solutions by the global market, ushering in the new paradigm for cybersecurity architecture. The Global Attestation and Identity Network has the potential to accelerate the transition from the existing network security solutions to a new model built on the assurance that the connected and measured devices are performing transactions the user intends. In Rivetz’s view, this is not only essential for a bold new world utilizing crypto currencies, but transforms data and network security as well. the use of these solutions by the global market, ushering in the new paradigm for cybersecurity architecture. 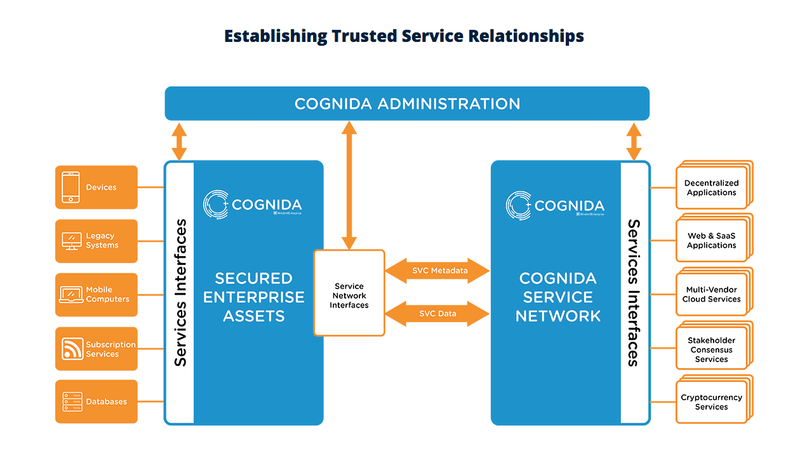 The Global Attestation and Identity Network has the potential to accelerate the transition from the existing network security solutions to a new model built on the assurance that the connected and measured devices are performing transactions the user intends. In Rivetz’s view, this is not only essential for a bold new world utilizing crypto currencies, but transforms data and network security as well. Rivetz is a state-of-the-art toolkit for harnessing the Trusted Execution Environment (TEE) to protect your secrets, your finances, and your privacy. It's like a hidden vault (already embedded in most phones) that no OS or software can eavesdrop on. Rivetz uses the RvT (Rivet) token and blockchain to cryptographically prove that the vault (TEE) in your phone is secure, from the manufacturer to your pocket. Once your vault's integrity and health is verified, you know any transactions you send are exactly the ones you intended. Only Rivetz utilizes the hardware security embedded in devices! Rivetz truly secures customers' devices and transactions from being exposed, and protects software development companies from financial exposure and public embarrassment. The shift to decentralized security requires that the integrity of the data is built-in to the system; reliance on network observation is no longer effective. Think of the TEE as a private “vault” inside your phone’s hardware – but instead of software (like apps and iOS/Android), it’s already built into your phone (the hardware). Inside of this vault, everything is isolated. No apps or software or operating system can see what’s inside. This could be your secrets, your passwords, keys, or any other private information. Rivetz uses the RvT token and blockchain to cryptographically prove that the vault in your phone is secure, all the way from the manufacturer to your pocket. The RvT blockchain can perform a health check, verifying that your vault’s integrity is intact, and that transactions you send are exactly the ones you intended. Fundamentally, RvT creates an ecosystem for cybersecurity micropayments. Your banks use RvT to verify identify for withdrawing funds. Your local store uses RvT to protect its supply chain. Through RvT, everyday society and actions are securely powered by the blockchain. 70M reserved for future use. Tokens will be sold for ETH. A Presale is available and will require a minimum purchase of 150ETH. For more information please contact [email protected]! The co-founders of Rewards.com — CEO Todd Rowan and CMO Linda Butcher — joined us on our Telegram channel this week for an AMA. They also were joined by Rewards’ VP of Marketing, Michael Shepherd. The following is a transcript of the conversation, lightly edited for grammar and spelling, and in some cases to bring multiple answers to the same question closer together. Linda: Just a little bit about us and our project. I am one of the co-founders. We have 15 years in the loyalty space, primarily around points programs. Last year, we took a major pivot and changed loyalty points into cryptocurrency. Bob Digital: How did you guys get introduced to Rivetz? Todd: We have been talking with Steven for many months now on how we can work together and formed a partnership last month. Rivetz: Please tell us a bit about the Rewards history — and how the points now convert into crypto? Linda: Sure. The team has been running loyalty programs B2B for companies like Bank of America, AmEx, Caesars, hotels, airlines for many years. The programs centered around mostly shopping, where a member shops and earns a point like a Hilton point (for example). Todd: We have been doing reward program for the banks and airlines for many years. We were in the process of taking Rewards down the standard points path with a new marketplace when we took a deep dive into looking at blockchain and crypto and realized that this was a great fit for a rewards program. Bob: Are you just converting current points into a token or is there a token sale, too? Linda: Rewards is already an existing platform, as you know. Right now, any members who leave their cash back in their account will automatically convert to the RWRD token in May. The transition to RWRD tokens on the site has already begun. Those who have balances in May will get a 25 percent bonus on the balance when they convert. Bao: Does Rewards.com offer incentives for third-party entrepreneurs trying to utilize the RWRD token? Todd: We will be rolling out the full rewards protocol for other rewards programs to link in. Rivetz: So how does that work? Obviously, before, people were able to cash in rewards with partners such as hotels, airlines, etc., as you said above. How will they be able to use the tokens? Linda: That’s one of the reasons I think the community likes us. We’re easy to understand. Everyone likes earn rewards. And earning a crypto for making purchases for hotels, clothes — the stuff you buy anyway — is a no-brainer. Rivetz: How will they be able to use the crypto? If you could explain the mechanics of it. Is the token just a different form of a point? And what does the partner do with the token then? Linda: RWRD tokens can be redeemed for food, clothes, tickets — pretty much anything. RWRD tokens also will trade on the exchanges. Todd: You can look at the token as a form of point, but with real value unlike a hotel point. So that does a few things: it lets the customer set the value, and it makes the point/token fungible across the network. Merchants currently do not have to worry about the crypto part of it, as we do all the conversion on our side. Rivetz: So people will be able to buy tokens on exchanges that they then will be able to use with Rewards partners? That sounds very interesting! Linda: My response tells you why there will be millions of shoppers and consumers using the program. For example, Rewards currently has more than 7000 merchant partners, such as Walmart, Groupon, Staples, Lowes, etc. If you shop through Rewards, you will earn RWRD if you make a purchase. Let’s say you buy a grill from Lowes and pay $400. You would earn $20 in RWRD. You can use your RWRD token for a Subway sandwich or concert tickets — or you can take them out on the exchanges and trade them for Bitcoin. Todd: They can buy from the exchange or earn then from our merchant partners. As tokens are earned, we have to buy from our exchange partner to fulfill the new earnings. 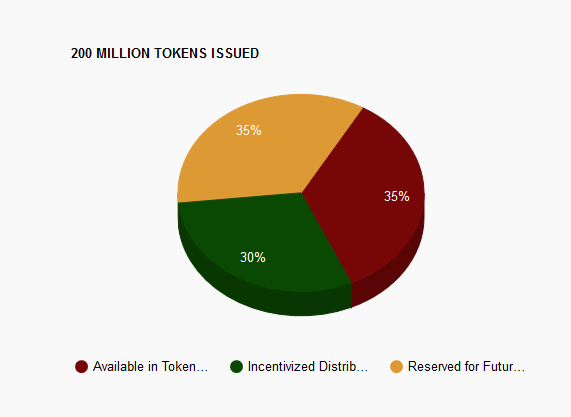 For every 100,000 shoppers, we have to buy about 5 million in our token from the market. Bao: Could you describe, in short, why you’re choosing to use the blockchain technology for other reasons than the security aspects of it? Linda: The first phase of the project is ERC20. In phase 2, we are actually going to be creating our own blockchain. This will let us leverage years of experience in loyalty, helping the hotels with things like customer management, cost savings around the loyalty process itself — and the most beneficial thing of all, the RWRD token is not a liability for the program. The application will run on Ethereum and will consist of multisig wallets, smart contracts, and an off-chain ledger stored in a private database that will be published daily to IPFS for transparency and whose hash will be stored on Ethereum. There are bunch of reasons, but some of them are just cool. Because we are all about engagement and doing things like contests, voting, etc., our community now has the opportunity to participate actively by voting in new merchants, voting out merchants, (or even) allocating RWRD tokens for things like disaster relief. Pretty much anything they can think of. Todd: The blockchain allows us to do many things. First, it allows for a global exchange of currency. There is no other reward program where you can earn in the U.S. and spend in the U.K., for example. It also allows for many programs to take advantage of the same platform and consumer base, while allowing the consumer to control their own data. Then, there is the currency having real value — this lifts liability from the program and allows them to exchange currency with other programs. And many more (aspects). It’s just an amazing fit. Bao: Where is the intrinsic value of RWRD based on? As in, when you say $20 worth of RWRD, does that mean the token is based on the value of the U.S. dollar? Todd: As we drive sales for our merchant partners, they pay us part of the transaction. So, you go to Home Depot and spend $100, we get about 7 percent — or $7 — of that transaction. We will take that and buy tokens from the market to give you your $7 worth of RWRD tokens. And if the token comes back for redemption — say you go to lunch at Chili’s — your token will convert for the merchant at the current spot price of the token. We will use a mobile payment app for this. Bao: Will there be rewards for getting more businesses signed up to join Rewards.com (affiliate marketing)? Linda: We will layer in Rewards through entire platform. We do have a referral program. Todd: We have been in the market for over 15 years building programs for Bank of America, American Airlines, United Airlines, Sony, etc. Over that time, we have built more than 7,000 merchant relationships and are adding more all the time. Rivetz: So @Bob_Digital & @bao asked at the very start: How does Rivetz fit into all this and how do you see us integrating with each other? Linda: I think Rivetz is a good partner because they have a solid team and many years of experience — but the more direct answer is the security layer. We do have a wallet, and one of the areas we’ll expand out with our partnership with Rivetz is the security for the wallet. Todd: Rivetz has a currency management platform coming out that will fit very well with Rewards as we move into the white label part of our program for rewards programs. This will all us to move white-labeled currency between programs with security and ease. Michael: Hey guys, because we love our partnership with Rivetz, we wanted to give you guys a special referral bonus. So anyone that enters in a referral code ‘Rivetz’ when signing up will get a 100 percent bonus when they participate in our token sale. To join the token sale, just go to rewardstoken.io and click on “Buy Token” at the top. Bob: Is the token sale open to non-accredited U.S. citizens? Michael: The token sale is current open to non-U.S. investors and accredited U.S. investors at this time. However, we will have two other opportunities for non-accredited U.S. investors to join, providing there are still tokens available after our marketplace launches. You can join in at that time or on the open exchange. For more information about Rewards, visit their website Rewards.com or their token sale site, rewardstoken.io. If you have further questions about the Rewards token sale, visit the Rewards Telegram channel. For more information about the partnership, visit the Rivetz Telegram channel. 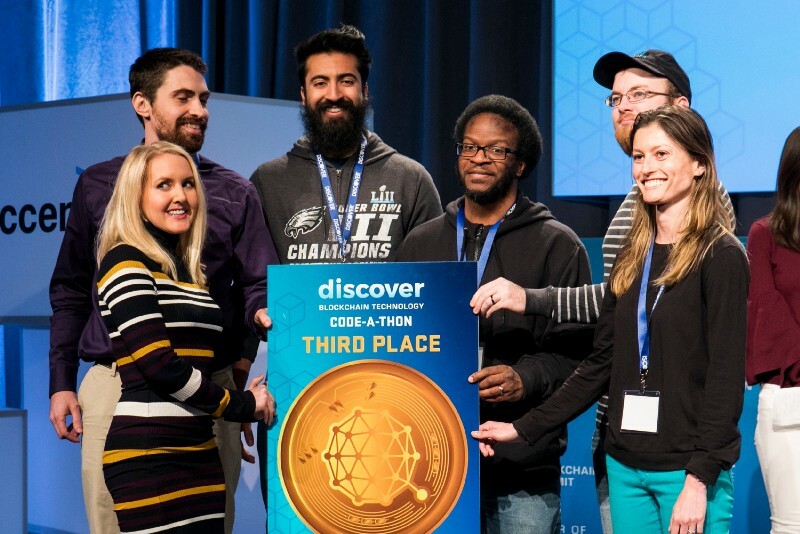 A team including Rivetz app developer Tyler Diaz captured second place in the Discover blockchain technology hackathon as part of the D.C. Blockchain Summit run by the Chamber of Digital Commerce this month. 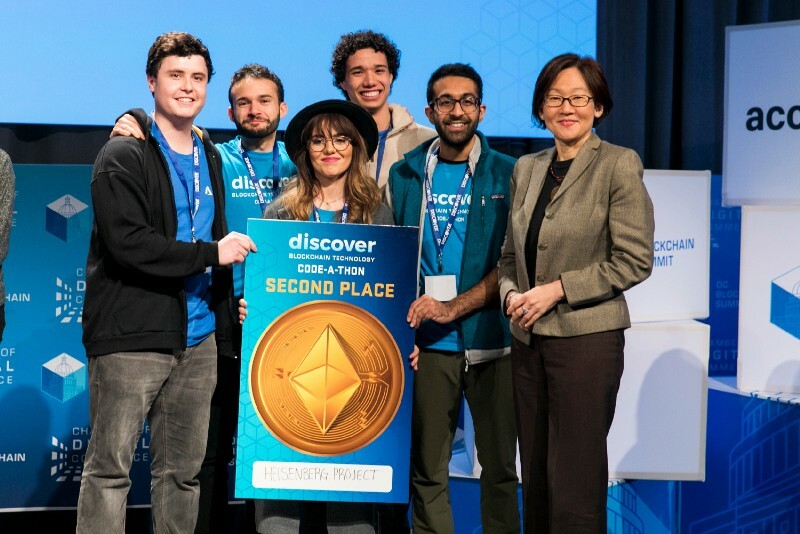 Tyler’s team settled constructing a solution that solves a few problems with the existing prescription system: synchronizing which patient has collected which RX among doctors (to prevent patients trolling between hospitals for drugs) and making forgery impossible (since it’s cryptographically proven). There is no authoritative source of truth when it comes to the data layer for pharma prescriptions. The design used the ERC-721 in a consortium Ethereum blockchain. The idea was to use non-fungible tokens as a way to represent each prescription drug. If they had used an ERC-20 token instead, a doctor theoretically would be able to swap opium for Adderall within the network. The five team members slept on floors and fueled themselves with junk food for the 24-hour hackathon, which started at 8 a.m. March 5. The team won 3 ETH. Doctor — Prescribes medication by executing a smart contract that tokenizes a valid prescription, based on metadata such as Doctor ID, Patient Name, Quantity, Dosage, and Expiry Date. 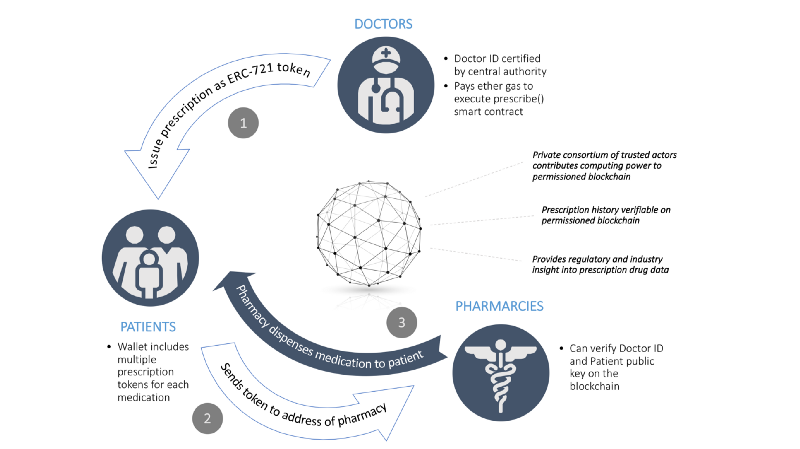 Patient — Receives a token representing a valid prescription issued by a Doctor. Fills a prescription at an authorized Pharmacy by sending token to the Pharmacy’s public wallet. Pharmacy — Disburses medication after receiving token from a Patient, and is payment-agnostic as to receiving token or fiat currency as payment for prescription. Verifies a valid prescription by checking the permission blockchain for a signature between the Patient and Doctor. The first-place team was dubbed “Seek Refugee” and its solution was to help provide a dignified journey for refugees. 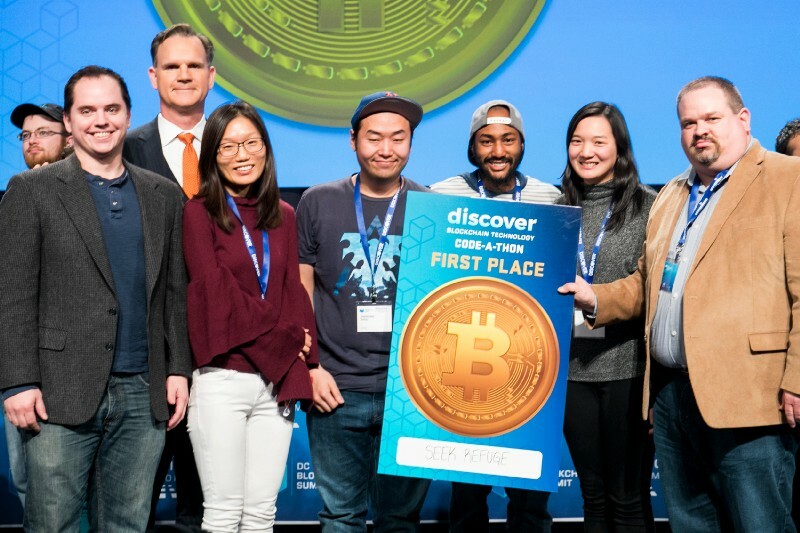 They won 1 BTC. Rivetz CEO Steven Sprague is an advisor to Bob’s Repair. They recently asked him to join their Telegram channel for an AMA with their community. This is a lightly edited transcript of that chat. Steven: Wave was started by my dad in 1988. Peter Sprague had been chairman of National Semiconductor for 30 years. The company went public in 1994, and I became president in 1996 after the company ran out of money. No product no sales and 3 million in debt. Todd: Nice… What did you do to turn things around? How did you survive the dot-com bust? Steven: In ’96 I hired Joe Trippi to help me build a social following for the equity and to invest in building our social media groups. We built from zero to to over 12,000 active daily contributors. In 1997, the company got delisted to the pink sheet at 50 cents per share, was then relisted in 1999 and then raised $122 million at $34.00 per share and bounced off $50 per share and a $2.5 billion market cap. Then we shipped 160 Million copies of OEM paid-for software for trusted computing and built global enterprise partnerships with GM, BASF, BP and others. I left in 2103 to shift focus to mobile security and started Rivetz. Todd: I know that the Trusted Computing Group was one of the first efforts to put real security right into the chips that run all of our PCs. How do you think blockchain-based ideas will be integrated into the infrastructure of the future PC and internet industry? Steven: Great question on TCG and Blockchain. I think these technologies will fit very well together. Trusted computing operates tokens, tokens operate chains. The goal is to add quality to the data that is stored on chain so the data recorded can be proven to come from a known source. Frideric Prandecki, Bob’s Repair Community Manager: This is more of a personal question. 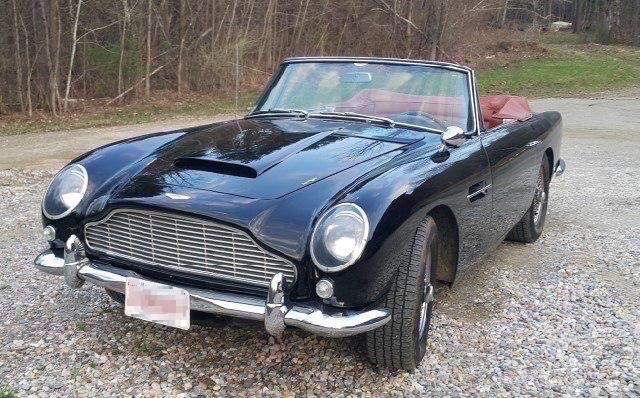 Your dad owned Aston Martin, the car company. As a young man did you get a chance to drive a bunch of amazing cars? Frideric: Send us a picture if you are near it. Awesome. The only way to travel. None of this Lambo stuff. It’s been in the family since 1979. By the way — I’ve done a 1: 15 sec lap in that car and a 1:05 in the V8 Vantage. Frideric: My Honda Civic isn’t that fast. Steven: But a Civic can be just needs a few parts and some bob’s talent. Amy, Rivetz: A question I know many of our Rivetz community folks are interested in: What about Bob’s Repair drew you to it to join the advisory board? Steven: I Love the Bob’s Repair project. I have spent my whole life doing construction as a hobby and have built three houses, so the whole concept is great. Frideric: Can you tell us what can we do for security with our cold storage wallets? I heard now the Nano S can be hacked. Where do you recommend we store our crypto and how? Steven: For corporate cold storage we use paper and a large bank vault. We strongly suggest the best model for all wallets is multisig where practical. In general, Ledger is one of the best choices for external hardware wallets today. Rivetz is working on a next-generation solution with the TEE and support of other embedded security, like SIM, to support dual private keys with dual supply chains. Crypto Dingus: In a perfect world where the Rivetz product is functional and ready to go, how would that look like working with Bob’s Repair? Steven: Everyone need to have a few Bob tokens to help with all those undone projects. Crypto Dingus: My understanding is that Rivetz has multiple partnerships. How will you manage all of the time requirements for these partnerships in getting steps completed? Steven: We have a team that is working to support partners with a standard developer’s tool set and reference examples. Frideric: Steven, can you tell us more about 2fa and what is Rivetz doing with that? Steven: Rivetz is providing a 2FA that is fully supporting the trusted execution so your secret seed is protected by the trust models of TEE. For more information about Bob’s Repair, visit their website or join their Telegram channel. Today, Rivetz announced a new partnership, with information technology company Windmill Enterprise, developer of the Cognida platform. The open-source platform runs on top of the internet, establishing enterprise identities, permissions and security policies wherever digital assets connect to a network. Rivetz brings to the partnership endpoint security from the TEE on mobile platforms, letting their customers experience secure device ‘state’ and ‘identity’ for every transaction. “Enterprises face the daunting challenge authenticating thousands of users in a plethora of environments and granting them the appropriate access to information,” Rivetz CEO Steven Sprague said about the partnership. Today Rivetz announced that Wanchain, the world’s leading public blockchain focused on interoperability, will join their partnership with ElevenPaths, Telefónica’s Cybersecurity Unit, to offer blockchain solutions to enable the next-generation technology for some of the strongest privacy and cybersecurity protection for consumer and enterprise mobile subscribers available today. 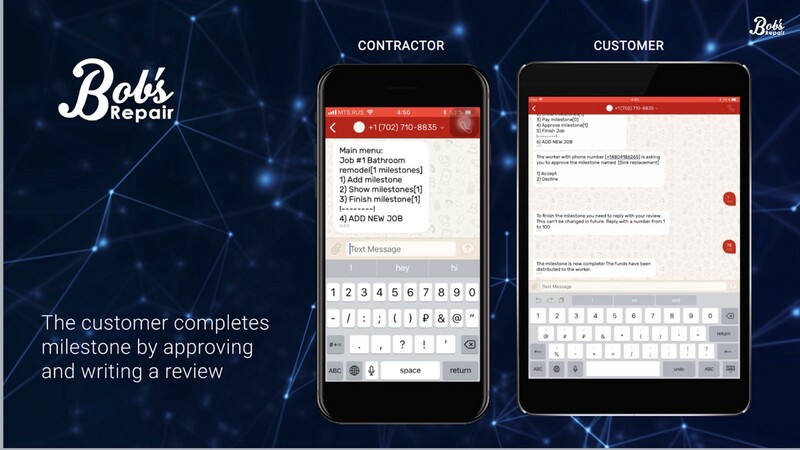 The partnership will offer blockchain solutions to enable the next-generation technology for some of the strongest privacy and cybersecurity protection for consumer and enterprise mobile subscribers available today. Wanchain, who enable decentralized transfer of value between blockchains, just celebrated the first birthday of their mainnet yesterday. Wanchain provide industry-leading cross-chain functionality — a key component for entrepreneurs and enterprises alike to leverage the Web 3.0 economy. Enabling a safe and frictionless flow of value between blockchains, Wanchain’s core technology paves the way for mass adoption of digital currencies. The solution simplifies the transfer of value from one currency to another and will offer users the convenience and simplicity that everyday use requires. The partnership expands on Dual Roots of Trust, the built-in hardware security technology co-developed by Rivetz and ElevenPaths, enabling carrier-grade identity and e-commerce protections on potentially tens of millions of devices at Telefónica and billions of devices worldwide. 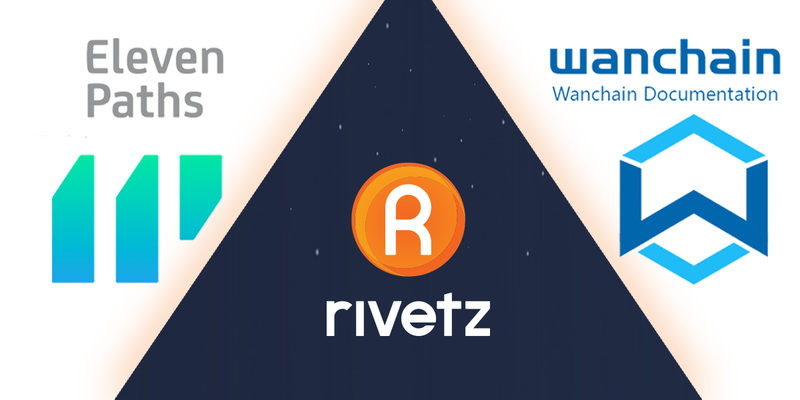 Wanchain will also integrate Rivetz’s advanced hardware protections to deliver a new level of assurance that transactions and data on blockchains are recorded as intended. Wanchain’s Jack Lu, Rivetz’s Steven Sprague and ElevenPath’s Pedro Pablo Perez each expressed their enthusiasm on the partnership and their ability to work with millions of users to bring privacy and security through the blockchain and digital transactions.